Gain even more savings by pairing your flights and lodgings. Expedia has heaps of outstanding Dawson City vacation packages that'll simplify things and give you more money to spend! Book now on Expedia and gain savings of up to C$590*! It really is that simple! With more than 400 partner airlines and 321,000 properties to select from on our extensive database, you won't have any trouble organizing your dream vacation. Need more time to decide? There are no hidden fees from us when you change almost any reservation. Getting excited about your trip to Dawson City? Want some advice about what to see while you're there? That's where we can assist! History is brimming with remarkable stories to be told and lessons to be learned. Make your way to City Park and get a look into the past. There's a fabulous range of things to keep you busy in this destination. Put down your history journals! Let the past jump off the page at Dawson City Museum. Still got time on your hands? If you'd love some spiritual enlightenment, swing by St. Paul's Anglican Church. You never know, you may even find the answers to a couple of life's most fundamental questions! Seeking out luxury getaways or cheap vacations in Dawson City? There are only 5 properties to choose from, so act soon! Expedia can help you out. If you're on the lookout for properties with first-rate reviews and snuggly beds, you really can't go past the Aurora Inn (5th Ave & Harper St) and the TRIPLE J HOTEL & CABINS (5th & Queen). Get through security, board the plane, track down your allocated seat and get comfortable! Your well-earned trip to Dawson City isn't too far away. When you touch down at Dawson City Airport (YDA), you'll find yourself approximately 9 miles (14 km) from the buzz of the main streets. Located in the heart of Dawson City, this motel is within a 10-minute walk of St. Paul's Anglican Church, City Park, and Dawson City Museum. 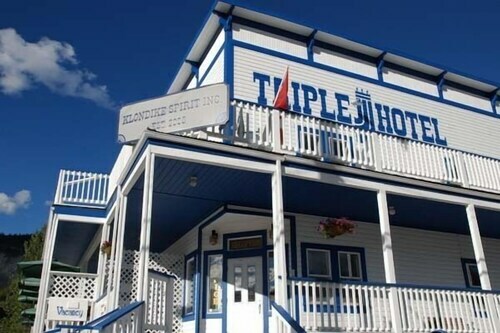 Situated in Dawson City, this hotel is steps from City Park and Dawson City Museum. St. Paul's Anglican Church is 0.2 mi (0.3 km) away. Situated in Dawson City, this hotel is within a 10-minute walk of St. Paul's Anglican Church, City Park, and Dawson City Museum. Situated in Dawson City, this hotel is within a 10-minute walk of City Park, Dawson City Museum, and St. Paul's Anglican Church. 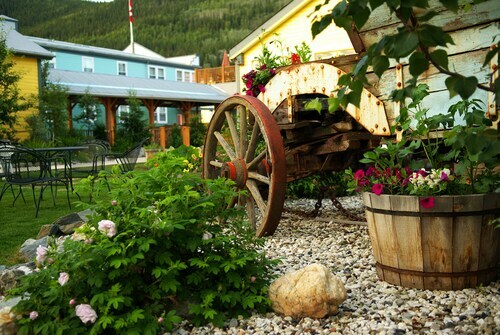 Situated in Dawson City, this hotel is steps from City Park and Dawson City Museum. St. Paul's Anglican Church is 0.2 mi (0.4 km) away. Situated in Dawson City, this hotel is close to St. Paul's Anglican Church, City Park, and Dawson City Museum.